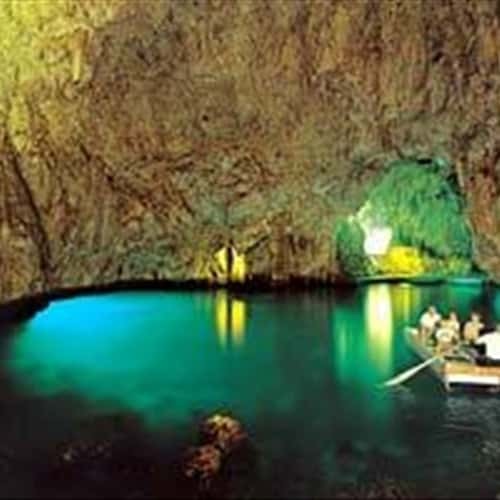 The Emerald Grotto is set in the charming bay of Conca de' Marini, 4 Km away from Amalfi. The waters breaking into the grotto take on an intense green hue, caused by light filtration. This cave can be reached by road using a lift or stairs, or by the sea. At the entrance a raft gets you into the cavern which, like magic, turns into a fantastic green temple full of figures, caryatids and bas-reliefs formed by dripping water from the vaulted ceilings, over the thousands of years. The most surprising thing, however, is offered by a number of sturdy stalagmitic structures rising from the sea which could never form if once the cave had not been on a dry ground. This stalagmites can now be found in the water because the bradyseism made the ground subside and carry into the sea the lower part of the cavern. An interesting feature: the underwater pottery crib.